A few months ago I wrote a post about my experience with Jamberry Nails. At the time I was intrigued with the product and eager to try it out. Painting my nails is not something I have the luxury of doing on a regular basis and finding the time to actually get a manicure is out of the question. I did not have a great experience when I first tried the Jamberry Nail Wraps but as I said in my original post I felt like it was my fault. Even the consultant that gave the party admitted she did not do a good job demonstrating how to apply. I decided to try it out again because I really did love the idea of them and the designs are amazing. Lets be honest, how many people actually have the time to do any of the crazy nail art we see in the magazines or on Pinterest. After trying again I had success! I was so excited! Now I am a little addicted. If applied correctly, they last a week on me. Other people say you can get 2 weeks out of them but to be honest, after a week I am ready to switch them out anyway! The picture on the left is right after I applied the Jamberry and the picture on the right is 7 days later. 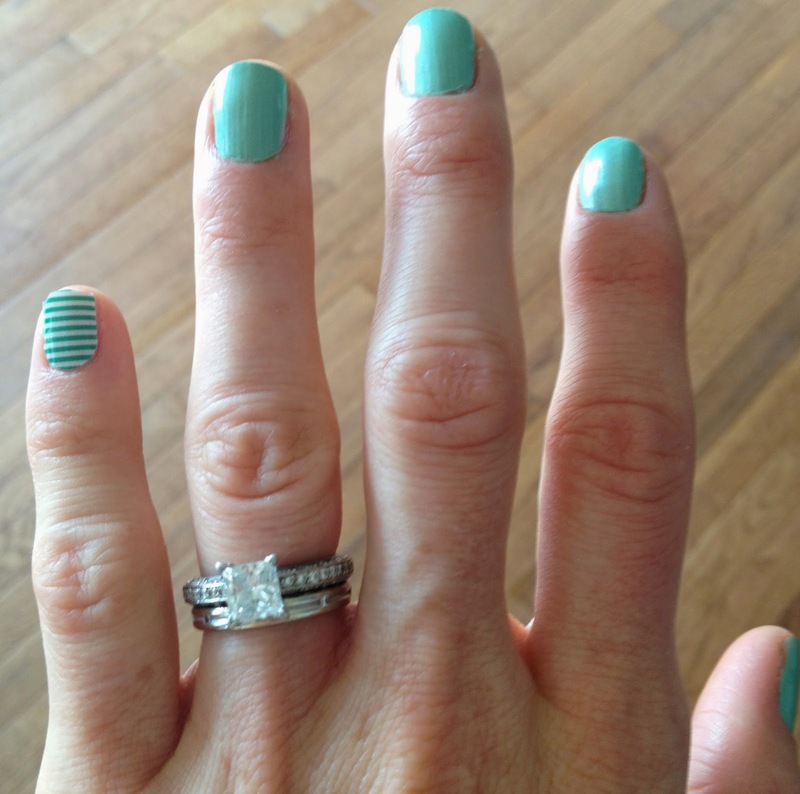 It is amazing to see the difference between the Jamberry and the nail polish. It lasts so much longer! Below I did an pinkie accent with a Jamberry sample I had been given and painted the rest of my nails with a cute nail polish I received in my latest Birchbox (review to come.) It was perfect for a neighborhood brunch and Eater egg hunt! This is the current design I have on my nails. 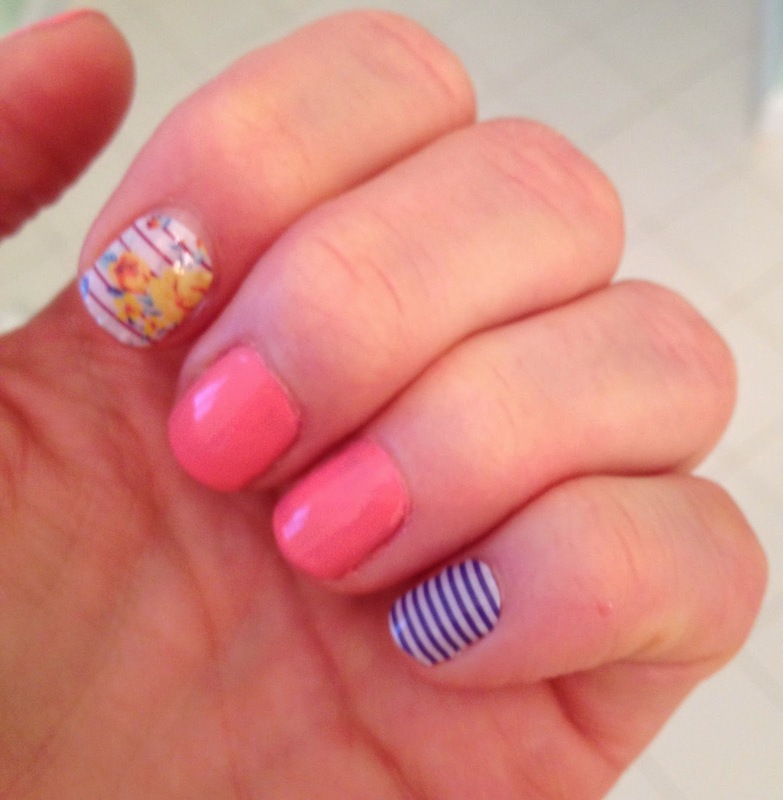 Pointer and pinkie were Jamberry accents and the pink is regular nail polish. Pastel and Springy...perfect for Easter! I love these nail wraps so much I have decided to make the leap and become a Jamberry consultant. If you have any interest in learning more about them please reach out and let me know. I would be happy to answer any questions!